Want More Butterflies? 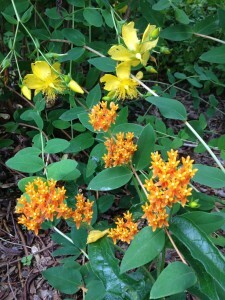 Plant Butterfly Weed! 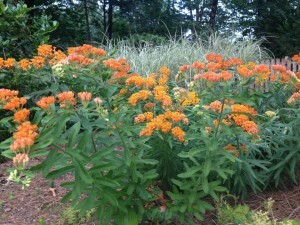 Butterfly weed, Asclepias tuberosa, is the pretty orange flower, shown in the picture on the right in my very hot and sunny front border. It’s right at home with other butterfly attractors including salvias, trailing white lantana, purple and red gomphrena, zinnias, mexican heather, other heat loving annuals and, shown in the picture with the butterfly weed, a yellow hypericum shrub. It also is happy with other perennials. To be successful in atracting butterflies, you need to have sources of nectar, sources for them to lay their eggs on, and plants for the caterpillars to feed on…monarch butterflies like to lay their eggs on this asclepias, so it’s a very good butterfly plant to have! It’s the flowering star right now in my garden and in my friend and wholesale grower Carole Barton’s garden also. Her very impressive stand of it in the picture to the left must be heaven for butterflies! Even for those folks opposed to orange flowers, I hope you will try to find a spot for this one anyway…in addition to attracting butterflies it also is a magnet for other beneficial insects including lady beetles and bees. This entry was posted in Flowers, Perennials, Planting Tips and tagged asclepias tuberosa, attracting butterflies, butterfly weed, flowers for butterflies, gomphrena, hypericum, lantana, mexican heather, perennials for butterflies, salvia, zinnias on June 22, 2013 by Kris Blevons.